SiTek is happy to announce that we now also have the possibility to offer PSDs with Flex Film connectors. 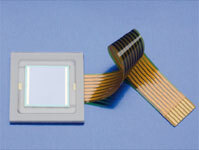 The Flex Film connector is a thin, flexible polyimide film which connects the PSD to other electronics. This connection alternative is especially suitable for applications where the space is limited. Not only can the PSD package be made extremely thin but since the flex film can be bent, folded or twisted it increases the freedom of the system designer and thereby renders the possibility to design very compact PSD systems.